Attention Beavercreek, Ohio: Althea Harper will be at Jenna Claire Handbag Studio on Saturday October 3rd. Click here for more information. We would love a field report. Qristyl Frazier will be at Phoenix Fashion Week. Click here for more infomation. Bravo has announced that Project Runway Season Four Champion, Christian Siriano will be getting a tv show of his own. Click here for more information. The Magical Elves are producing. When does Christian sleep? Heidi Klum is on Ellen today - click here for a preview. Project Runway Season Six designers Christopher Straub, Qristyl Frazier and Althea Harper will be on The Rachael Ray Show tomorrow. Click here for a preview - Nina Garcia is judging. FINALLY. Tim Gunn will be on The Bonnie Hunt Show tomorrow. Tim will also be on The Late Late Show with Craig Ferguson on Friday night. There is still time to bid on the episode six garments. Right now Christopher's design has the highest price. Click here to see all of the auctions. Also, please vote in our Episode Six polls. Do you agree with the judges? 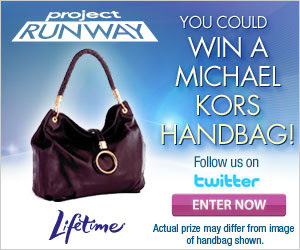 MyLifetime.com is celebrating the Return of Michael Kors with a handbag sweepstakes! Click here to enter. Click here for a profile of Althea Harper from Cincinnati.com. 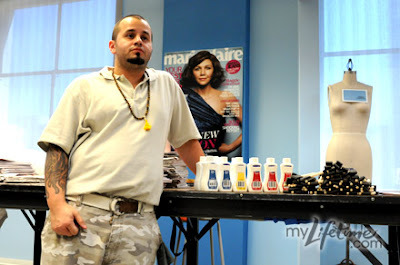 Click here for fashion tips from Project Runway Season Four designer, Kevin Christiana and Rachael Ray. Fashion in Detroit begins on Thursday! Click here for a new article from The Detroit News. Ra'mon-Lawrence Coleman will be designing a collection of organic junior clothing for Holy Cow. Click here for the story. In this Macy's commercial (which I love!) we can see two designs behind Tim Gunn. Can you identify BOTH of the garments? How about the name of this episode and the winning designer? Suzq has provided us with movie-themed commentary on each of the episode 6 designs. Click here to see them all. Thanks suzq! "To me it could have been Barefoot Appalachian Li'l Abner Barbie." Another memorable quote from Michael Kors. Pop Quiz: When was the first time Michael referred to a design as "Mother-of-the-bride?" Chloe Dao is recapping PR for Marie Claire. Who knew? Eric3000 shouts Hooray For Canada! Lorraine: Nina and MK are dead! Miz Shoes says Epperson wuz robbed! Second City Style needs MK back! And Toyouke gives you just the facts. Edited to add: Don't miss Cliffie! Thanks recappers, see you next week! Click here for a new interview with Nina Garcia from MarthaStewart.com. Click here for a designer profile of Stella Zotis from Stylewhipped. 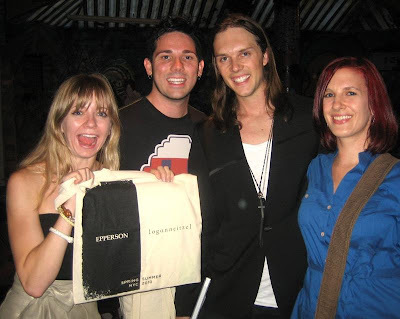 Click here for more news about "Fashion in Detroit." Episode 6 Online - "Lights, Camera, Sew!" Don't forget that you can watch Project Runway Episode 6 Online by clicking here at myLifetime.com or On Demand with your cable provider. "She Looks Like a Paper Brioche"
Here is exhibit #1 in "Why we miss Michael Kors." Now, who can tell us which garment prompted the comment, "The crotch on those pants is insane!" Project Runway Season Five designer Stella Zotis presented a Fashion Show in NYC on September 17th. I let her catch her breath before asking for an interview! Stella is uniquely talented and a lot of fun. Click here for more photos of Stella's designs. Christian Siriano will be in Chicago tomorrow, and in Bethesda Maryland on October 3rd. Tim Gunn will be in Paramus, NJ on October 10th. Laura Bennett will be in San Diego on October 17th. Laura Bennett will be in Los Angeles on October 23rd. Tim Gunn will be in San Jose, CA on November 7th. Please send us a report if you are able to attend any of these events. Thank you! Her Majesty Queen Rania Al Abdullah of Jordan wore a Rami Kashou design to a dinner at Cipriani last night. The dinner highlighted the Millennium Development Goal of reducing death from childbirth by 75 percent by 2015, saving 10 million lives. Click here for more information. Attention Washington DC: Christian Siriano will discussing Fierce Style at the Corcoran on Nov. 3rd. Click here for details and to purchase tickets. Click here for "Hooray for Hollywood" from MSNBC. Thanks Sabrina. Project Runway Season Five designer Emily Brandle will be at the "Jill of all Trades" fair in Santa Barbara on Saturday. Click here for more information. Project Runway season four designer, Joe Faris is leading the team of Fashion Insiders staging a new fashion event in Detroit. Betsey Johnson, Kevan Hall, Kevin Christiana, and many others will be showing on October 1st and 2nd at Fashion in Detroit. Click here for a story about FID from New York Magazine. Click here for a story from CNN Money. Please let us know if you are able to attend - thank you. When presented with this challenge you knew immediately that you wanted the science fiction genre. You spun a fantastic tale involving an ice queen and you knew exactly how she would look and the kind of gossamer gown that she would wear. After Tim's critique, you understood that this was the time to show your skill with costume and drama and your styling and makeup further enhanced this evil beauty of your fantasies. The regal results did not leave the judges chilly; John Varvatos said the detail was spectacular and Zoe Glassner called it clever, bold and risky. 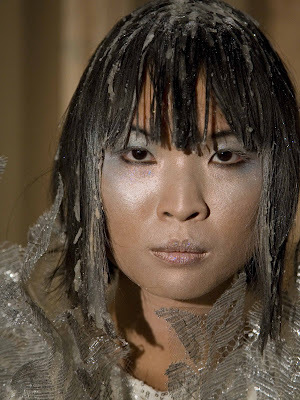 Your frosty fashion was a tour de force in snowy sequins and alabaster-hued applique. Good show, Nicolas! This post is only for positive words for Nicolas Putvinski. If you have negative commentary or something to say about another designer, you may do so in our Reactions post here. Image courtesy of MyLifetime.com. Click on the picture for a larger view. In 'Rumble on the Runway' you triumphed as a non-leader in a team challenge, a Project Runway first. In that episode you thought and worked quickly and your efforts paid off when you made Nina Garcia happy with your neoprene dress. In another Runway first Tim Gunn purchased that outfit for Nina; we'd love to see her in it! This week your concept was too ambitious for the amount of time allocated and sadly Nina was not on hand to judge your efforts. 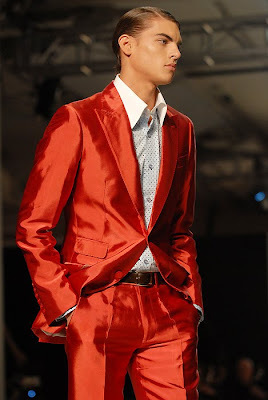 You were still able to show a collection for Spring 2010 and no doubt we will witness more success from you in the future as a talented designer with a vision. This post is only for positive words for Ra'mon-Lawrence Coleman.If you have negative commentary or something to say about another designer, you may do so in our Reactions post here. You've seen the designs on the runway and now it's your turn to be the judges. This week you are Heidi Klum, John Varvatos, Arianne Phillips and Zoe Glassner. Movie night on Project Runway provided a bit of a love story and a somewhat shocking elimination. Did the judges get this one right? Post your reactions to Episode 6 here. Are you ready for your closeup? It's open casting night on BPR as we watch Episode 6: "Lights, Camera, Sew" together. Everyone is welcome whether you are a star, extra, bit player or member of the crew. Join friends and fans from across the land as we snark our way thorigh another new episode of Project Runway. Tbone has live play-by-play of Episode 6 beginning at 10:00 p.m.
Project Runway judge Jennifer Rade served on the Fashion Wrap panel with Nick, Carrie Ann Inaba and Lawrence Zarian. Project Runway Swami Alan Gratz offers up his weekly recap and predictions for Episode 6 in hilarious fashion. Casting movie stars in the role of designers, he creates his own version of Ocean's Eleven. 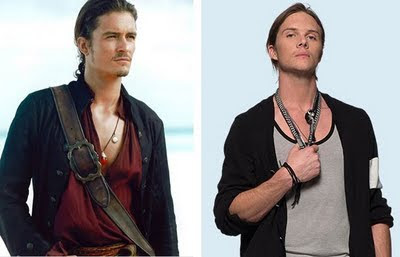 Here we have Orlando Bloom in the role of Logan Neitzel. Can you guess who plays Epperson? Our polls for Episode 5 are closed. 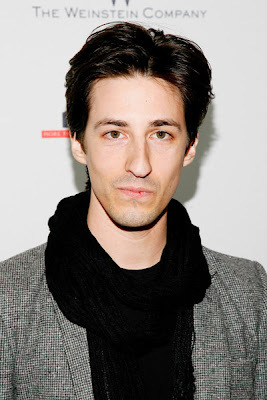 You disagreed with the judges and felt that Christopher Straub deserved the win. Click here to see the results. You agreed with the judges and thought that Johnny should have been the 'auf.' Click here to see the results. Click here for a Bluefly trend report including an interview with Korto Momolu. Click here for a new interview with Nina Garcia. Nina reveals a proposed season six challenge that didn't make the cut. In more Nina news check out Nina tonight as she guest stars on The Beautiful Life. Tim Gunn will be a guest on The Tonight Show with Conan O'Brien tonight. Receive a 20% discount on all of Irina Shabayeva's designs by entering WINNER at checkout here. Click here for more information. Jes Switaj is back with a report from Epperson and Logan's show. Thanks Jes! On Monday morning I attended Epperson and Logan Neitzel's collective fashion show. It was held at The Garment Room, normally a boutique for vintage designer clothing. The below-ground space was colorfully done up with collaged and graffitied walls. Logan showed first with fabric choices from flowing chiffons to sleek leathers. His color palette was strictly black, white and royal blue. The overall feel of the collection was Grecian goddess meets Roman gladiator with the tiniest pinch of Mad Max thrown in for good measure. Project Runway Season One champion, Jay McCarroll joins Kevin Federline and some other people whom I don't recognize for season 7 of Celebrity Fit Club. Go Jay! BPR's intrepid field reporter, Jes Switaj was at Gordana's show on Monday night, and sends us this report. Thanks Jes! Monday evening I attended Gordana's Spring 2010 Collection fashion show. It was held at the Sam Brocato Salon in Soho. The event was catered with a lavish fruit and cheese table, sangria and a wine tasting. Guests mingled and indulged for about an hour before the show began. Several other Project Runway alumni as well as a few Season Six models were in attendance. Gordana's collection was very spring and was inspired by The Lady of the Lake and incorporated elements of that time period into modern design. Just about everything in the collection was made in white or pastel shades of green, blue, yellow and pink. Project Runway producer Desiree Gruber wore a stunning sequin Laura Bennett gown at the 61st Primetime Emmy Awards. Oh, and that arm candy is husband Kyle MacLachlan. 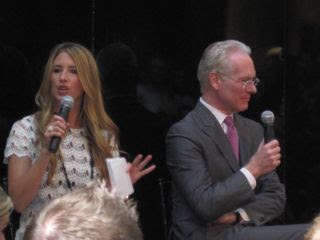 Tim Gunn was in Northern Virginia last Saturday for a fashion show including styles from several Liz Claiborne brands. Click here for a report from Allison K.
Click here for another look at Malan Breton's Spring 2010 Collection. Christian Siriano's new book, Fierce Style will be available in October and Christian will be on a fall promotional tour. Click here for more information. On Friday, Sept. 25th, Nick Verreos will be judging the "Needle and Thread" Style Competition at Style Week Orange County. Click here for the press release. Attention Philadelphia: Jay McCarroll will be teaching a class at Spool on Saturday, September 26th. Katrina Bowden wore a Christian Siriano design to the Emmys last night. She also wore Siriano to the SAG Awards in January. Adorable. ...to vote in our Which was more SHOCKING? poll. Also, do you agree with the judges? Please tell us who should have won episode 5 here, and who should have been eliminated, here. Auctions are underway for the episode five garments here. Right now, Christopher's dress has the highest bid. Megan offers her Top Ten List. Personally, I like number 5. Girlyshoes is missing Michael and Nina. We all are! Schnaufblog offers an updated list of Timisms. Also, please check out the BPR page on myLifetime.com. Thanks everyone. Check out Heidi Klum on the red carpet at the 61st Primetime Emmy Awards, in a custom made Marchesa gown. Holy baby bump, Batman! And Toyouke rounds it out as usual. Johnny Sakalis tells People magazine. "I had no reason to lie." Click here for Heidi Klum's plans for the red carpet tomorrow. 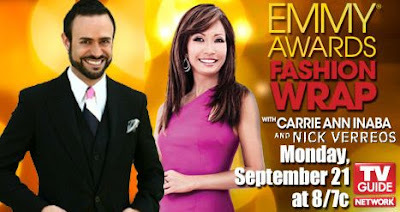 Heidi is nominated for an Emmy for hosting Project Runway. Our favorite show is also nominated for Best Reality Competition Program. Good luck Project Runway and Heidi! Click here for a look at Heidi's red carpet looks from past awards shows. Click here for a new interview with Nina Garcia. We saw Nina at Christian Siriano's show last weekend and she is super-thin! Please check out the new BPR Page on myLifetime.com. Episode 5 Online - "Fashion Headliners"
Don't forget that you can watch Project Runway Episode 5 online (click here for MyLifetime.com) and On Demand through your cable provider starting today. 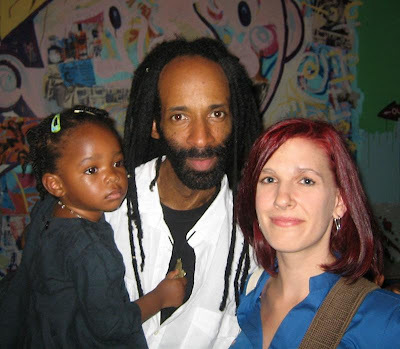 Click here for the Reality Ravings recap. Joanna Coles, Harvey Weinstein and Andrea Wong hosted a "Fall Fashion Week Celebration" and viewing party last night. 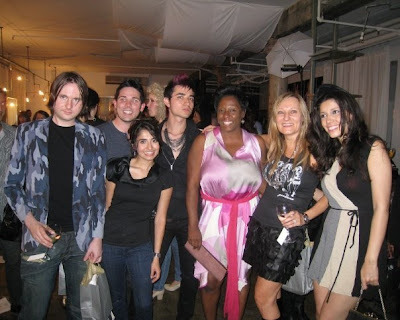 Many of the Season Six designers and models were there. Daniel Vosovic also received his $100,000 All-Star check - congratulations Daniel! Tim Gunn and Michael Kors were unable to attend. Click here for the photo gallery from WireImage. Poll: Which Was More SHOCKING? 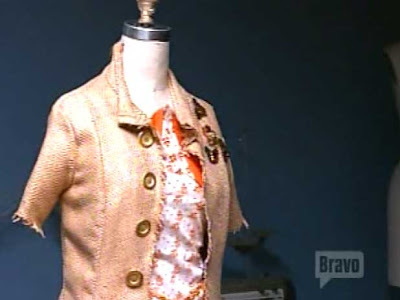 The unconventional challenges always test the ingenuity of the Project Runway designers. Looking at paper and creating a new fabric out of something so unforgivably fragile could be daunting but you embraced that you could scrunch the material, giving it more dimension and strength. Eva Longoria Parker announced that your coat blew her away while Zoe Glassner mentioned the clever use of the trompe l'oeil Sharpie stitches and how she loved the sleeves and the collar. Tommy Hilfiger said that it looked like "Coco Chanel meets Yves Saint Laurent meets Givenchy in the ’60's and ’70's" and, really how can you top that kind of praise?! It has to be extremely gratifying to triumph among so many other worthy candidates. Well done, Irina! This post is only for positive words for Irina Shabayeva.If you have negative commentary or something to say about another designer, you may do so in our Reactions post here. Let's forget about the hype. In Episode 1 we met someone who had battled a methamphetamine addiction and was, in part, inspired to turn his life around by the desire to get on Project Runway. That said more about your character and your strength than anything else; you put your mind on a goal and you achieved it. We watched that episode and saw you reach out to Tim and get what you needed - reassurance and a hug - and we saw you in the top three. This week you struggled with your garment but Zoe Glassner liked where you were going with your look, with the 80's and pop-art inspiration, and "was going there with you." Tommy Hilfiger admired the print you created and Eva Longoria appreciated your idea. Your talent is evident and, hey, you are one FIERCE runway walk coach. This post is only for positive words for Johnny Sakalis. If you have negative commentary or something to say about another designer, you may do so in our Reactions post here. You've seen the designs on the runway and now it's your turn to be the judges. This week you are Heidi Klum, Tommy Hilfiger, Eva Longoria Parker and Zoe Glassner. Did "Fashion Headliners" live up to hype? Post your reactions to Episode 5 here. Well, The Runway Rattler pretty much says it all. Come on in, the gang is all here. You don't want to miss this one! BPR Field Reporter, Nancy T provides this report from Malan Breton's Spring/Summer 2010 Show. Thanks Nancy! Malan Breton’s Spring 2010 Fashion Show was a classic. Classical music, classical dance (albeit pants-less in one case), and classical Malan design. The collection was more subdued than some of his prior Spring collections, but it had the trademark touches of luxe fabrics, clean lines, and a surprise or two. Where are Nina and Michael? Preview Video - "Fashion Headliners"
What is in Tim Gunn's Refrigerator? Episode 4 Online - "What a Woman Wants"